Nuu-chah-nulth people, since time immemorial, have always maintained respectful relationships with ancestral lands and waters. These relationships are the foundation of Nuu-chah-nulth cultural life — ways carefully nurtured in accordance to ancient teachings, for the benefit of all generations and all forms of life. The forest ecosystem was tended as a garden. It still is recognized as a living entity, with its own set of complex relationships among its many inhabitants, including people who continue to rely upon it for life. Countless generations of Nuu-chah-nulth First Nations people have maintained abundant economies and ecosystems, until this way of life was interrupted by Canada’s colonialism, which introduced unrestrained resource extraction, commodification and exploitation of nature. This was accompanied by cultural genocide, widespread environmental devastation and severe impacts to First Nation economies that continue today. British Columbia’s forestry policies and practices are founded on a colonial worldview that assumes there will always be more trees to cut and more profits to be made. In 1984, the conflict between Nuu-chah-nulth people and the timber industry, supported by the Canadian government, reached a dramatic climax when the ancient cedar forests of Meares Island were threatened with clear-cut logging. Tla-o-qui-aht and Ahousaht were not consulted about plans to log within ancestral territories. At that time, Tla-o-qui-aht and Ahousaht became determined to uphold ancestral values and teachings of care, and to defend ancestral lands and waters. In response to the planned logging, the Tla-o-qui-aht and Ahousaht First Nations sought an injunction from the court, which eventually worked its way to the B.C. Court of Appeal. 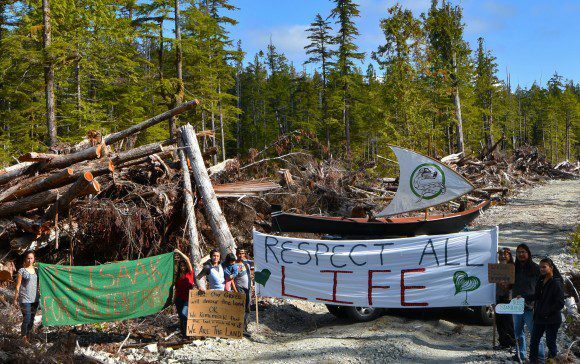 The court recognized the logging plans’ interference with First Nations’ rights and title, and placed an injunction on the island that A stand of old growth trees on Catface Mountain in Ahousaht territory. would halt the logging until land-claim issues were resolved between Canada and the Nations. In 1984, the Nuu-chah-nulth Nations Tla-o-qui-aht and Ahousaht declared Meares Island a Tribal Park. The island represents a mere fraction of the unceded territories. First Nations played a pivotal role in the 1980s movement to protect the forests. In the summer of 1993 the Clayoquot Blockades became known as the largest peaceful civil disobedience event in Canadian history. Following the Clayoquot Blockades of 1993, the Clayoquot Sound Science Panel was convened to develop recommendations for more sustainable forestry practices in Clayoquot Sound. While the recommendations are an improvement to the previous clear-cut logging, they do not measure up to the practices of Nuu-chah-nulth ancestors in terms of sustainable forestry. Following the 1993 protests, a joint venture involving five First Nations in the Clayoquot and Barkley Sound regions assumed control of the tree farm licenses in Clayoquot Sound. The venture formed into a logging company with the British Columbia’s forestry policies and practices are founded on a colonial worldview that assumes there will always be more trees to cut and more profits to be made. stated intent of implementing the Scientific Panel recommendations. B.C. law requires logging companies to pay hundreds of thousands of dollars in annual fees to maintain a logging license. The pressure to pay these fees means that a company holding a tree farm license must cut large volumes of trees to maintain financial solvency and retain the required logging licenses. The Canadian government continues to allow the timber industry to threaten and impact ancient forest ecosystems, cultural lifeways and Nuu-chah-nulth people’s existence. Old growth within Tla-o-qui-aht First Nation territory is now under serious threat. This September, damaging logging practices in the Kennedy Flats area were observed and documented by Tla-o-qui-aht First Nation citizens. A petition is circulating asking elected and hereditary leaders to do what they can to stop any industrial logging of old-growth forests in Tla-o-qui-aht First Nation territory. Recent interviews and forums confirm that the majority of Tla-o-qui-aht members (interviewed to date) want all our existing old-growth forests protected. Nuu-chah-nulth jurisdiction supersedes the colonial laws of British Columbia and Canada. Tla-o-qui-aht First Nation members have not been properly consulted and have not given consent for the current logging plans in Tla-o-qui-aht territory. We, as Tla-o-qui-aht members, are committed to upholding our responsibilities to protect and defend the forests of our ancestral home to ensure that the sacred relationship with life-giving nature continues. 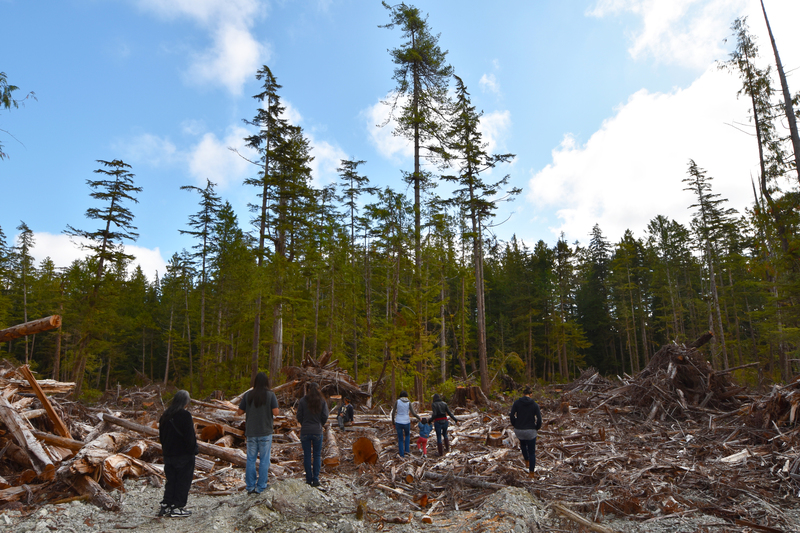 There is grave concern within the Tla-o-qui-aht community that logging in the Tofino Creek area is beginning.